In this file photo, Kevin Hart speaks to the media while volunteering to serve Thanksgiving dinner to a group of homeless people at the Los Angeles Mission on Wednesday, Nov. 21, 2018, in Los Angeles. The Academy of Motion Picture Arts and Sciences is reportedly doing something that hasn't been done in 30 years. According to Variety's sources, the 91st Annual Academy Awards will have no host, since the organization appears to have given up on finding a star to take on the role. The entertainment news site reported that the Oscars will instead recruit stars for various roles in place of "one marquee name to kick things off in a monologue filled with Trump zingers." An Academy spokesperson did not comment to Variety on the show's format. NBC has also reached out to the Academy. There are only six weeks until the show takes place live from the Dolby Theatre in Hollywood, California. This looming deadline apparently has producers "scrambling" to find A-listers willing to take part in the star-studded show. 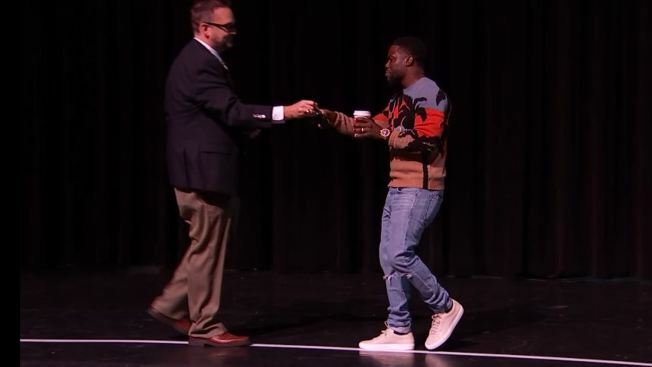 Their struggle to pull off the task come weeks after Kevin Hart was announced as the 2019 host, only to subsequently pull out of the show. Hart stepped down as host after homophobic statements resurfaced on Twitter, prompting the Academy to offer him an ultimatum. He could either issue an official statement apologizing for the remarks and remain as the host for 2019, but if he didn't express remorse, then they would have to rescind their offer. The comedian ultimately chose to pass on the opportunity. "I'm gonna be me and stand my ground. Regardless, The Academy I'm thankful and appreciative of the opportunity. If it goes away, no harm no foul," he said in an Instagram video. Nonetheless, he chose to express his regret about his prior tweets. In a Tweet, where he officially declined the role, Kevin said, "I have made the choice to step down from hosting this year's Oscar's....this is because I do not want to be a distraction on a night that should be celebrated by so many amazing talented artists. I sincerely apologize to the LGBTQ community for my insensitive words from my past." The debacle continued when Ellen DeGeneres invited the "Night School" star to do an interview on her talk show. During their discussion, DeGeneres implored Hart to host the Oscars, because she said the people who voiced their opposition are "a small group of people being very, very loud." "We are a huge group of people who love you and want to see you host the Oscars," DeGeneres said. She even went as far as calling the Academy herself to see if they would allow Hart to assume the position. She told Hart, "You are apologizing again right now. You've done it. Don't let those people win. Host the Oscars." However, Hart once again said no to the job offer. He told Variety, "The moment came and it was a blessing and I was excited at the opportunity and I still am. In my mind I got the job, it was a dream job, and things came up that simply prohibited it from happening. But I don't believe in going backwards."